Some defense companies have expressed optimism on the Trump administration’s plan to establish a new “space force” as they expect the proposed service branch to boost defense spending on space-related work, The Hill reported Wednesday. 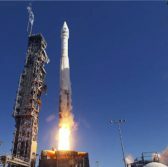 “It’s pretty exciting for all of us in the industry to see the intense level of interest that this administration and our Congress has in space,” said Tory Bruno, CEO of United Launch Alliance. “I think there is sort of, at last, an appreciation of how vitally important space is to all of our lives and certainly to our country,” he added. Todd Harrison, director of the Aerospace Security Project at the Center for Strategic and International Studies, said he believes most contractors welcome the White House’s proposal for a new space force. Harrison noted the plan to form a space development agency to oversee acquisition programs could provide smaller companies and startups an opportunity to compete for the Defense Department’s space contracts and expand into other national security areas focused on space.